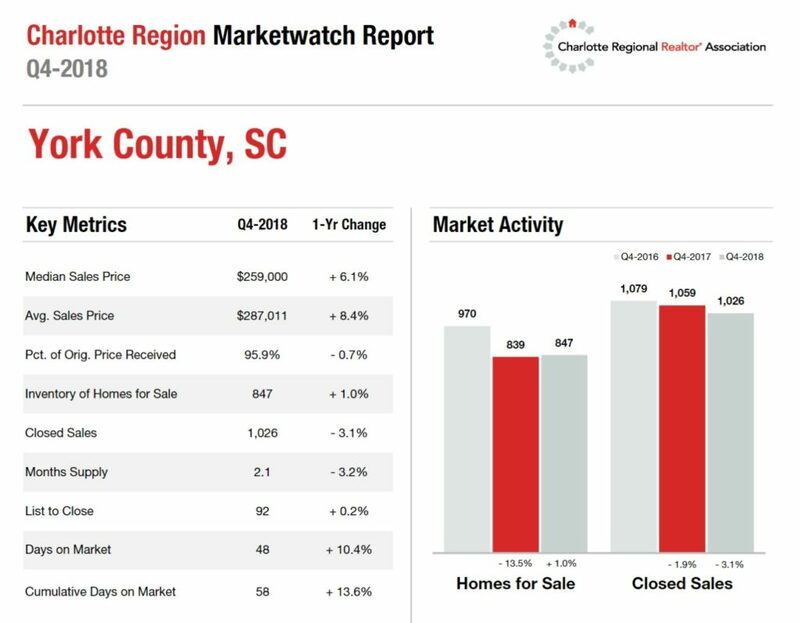 The “primary” story in four of the most populated and in-demand counties (Mecklenburg and Union Counties in North Carolina; York and Lancaster Counties in South Carolina) in the Charlotte region is the lack of inventory of homes for sale. 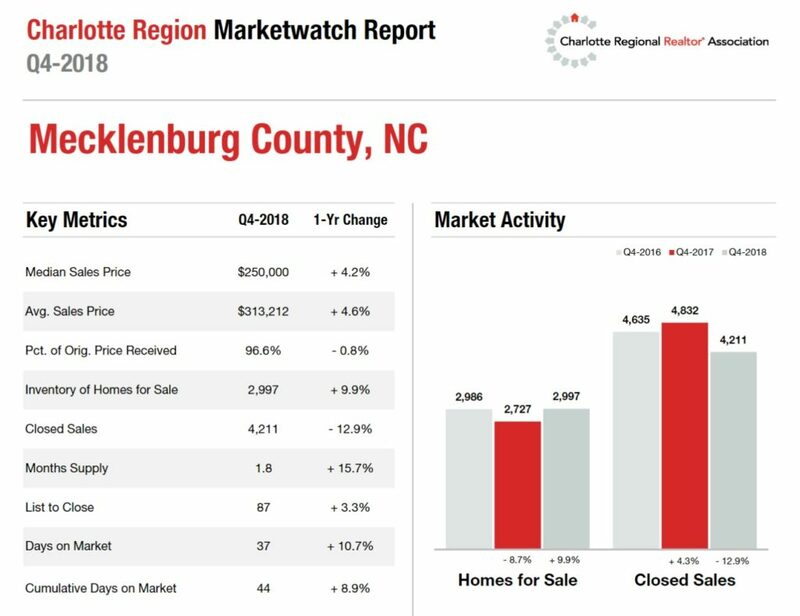 Mecklenburg County had just 1.8 months of inventory at the end of the fourth quarter and was the only one of these four counties that saw an increase in its inventory of homes in the quarter. Union, York, and Lancaster Counties had 2.5 months of inventory or less. 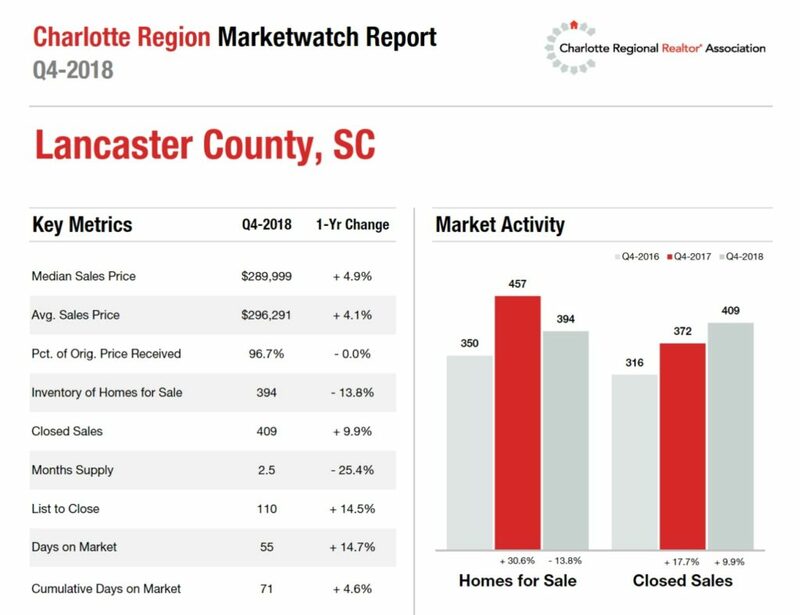 It’s clearly a seller’s market in these four Charlotte metro area counties and the lack of affordable inventory to meet demand continues to be “the story of the day.” This lack of inventory is also impacting home prices, dampening sales in some parts of the region, and affecting affordability. Lancaster County was the only one of these four that saw an increase in closed sales in the fourth quarter. Average Sale Price: up 4.6% versus one year ago (to $313,212). Inventory of Homes for Sale: up 9.9% versus one year ago. Closed Sales: down 12.9% versus one year ago. Months Supply of Homes for Sale: 1.8 months, up 15.7% versus one year ago. Average Days on Market: 37 days, up 10.7% versus one year ago. More details about how Mecklenburg County’s housing market did in the 4th quarter. Average Sale Price: up 4.7% versus one year ago (to $338,421). Inventory of Homes for Sale: down 9.9% versus one year ago. Closed Sales: down 5.2% versus one year ago. Months Supply of Homes for Sale: 2.2 months, down 11.4% versus one year ago. Average Days on Market: 50 days, up 12.5% versus one year ago. More details about how Union County’s housing market did in the 4th quarter. Average Sale Price: up 8.4% versus one year ago (to $287,011). Inventory of Homes for Sale: up 1% versus one year ago. Closed Sales: down 3.1% versus one year ago. Months Supply of Homes for Sale: 2.1 months, down 3.2% versus one year ago. Average Days on Market: 48 days, up 10.4% versus one year ago. More details about how York County’s housing market did in the 4th quarter. Average Sale Price: up 4.1% versus one year ago (to $296,291). Inventory of Homes For Sale: down 13.8% versus one year ago. Closed Sales: up 9.9% versus one year ago. Months Supply of Homes for Sale: 2.5 months, down 25.4%. Average Days on Market: 55 days, up 14.7% versus one year ago. More details about how Lancaster County’s housing market did in the 4th quarter. Buying Or Selling A Charlotte Region Home? 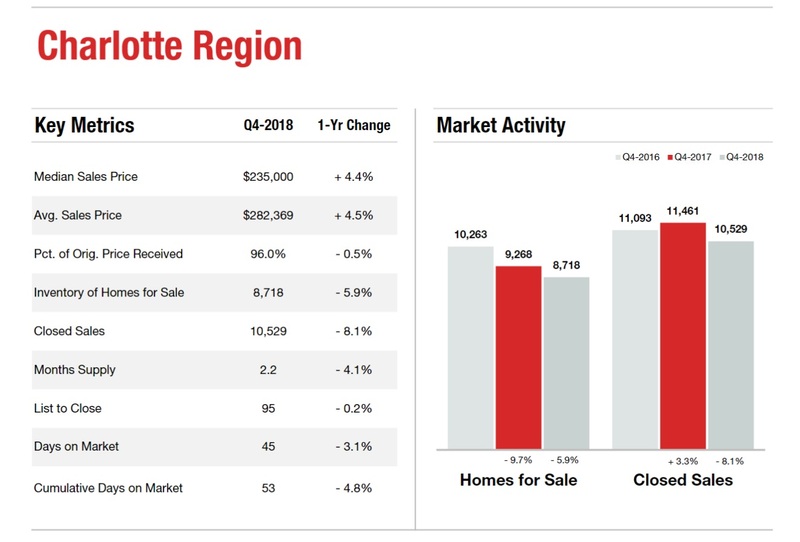 4th quarter 2018 Charlotte, North Carolina region's home sales continued the trends we've seen since 2015. Home buyers are finding the housing market very competitive with higher home prices and a lack of properties to buy. Buyers looking for a bargain are "hard pressed" to find one. Meantime, home sellers continue to sell their homes relatively quickly and for top dollar, when priced right for condition and location. 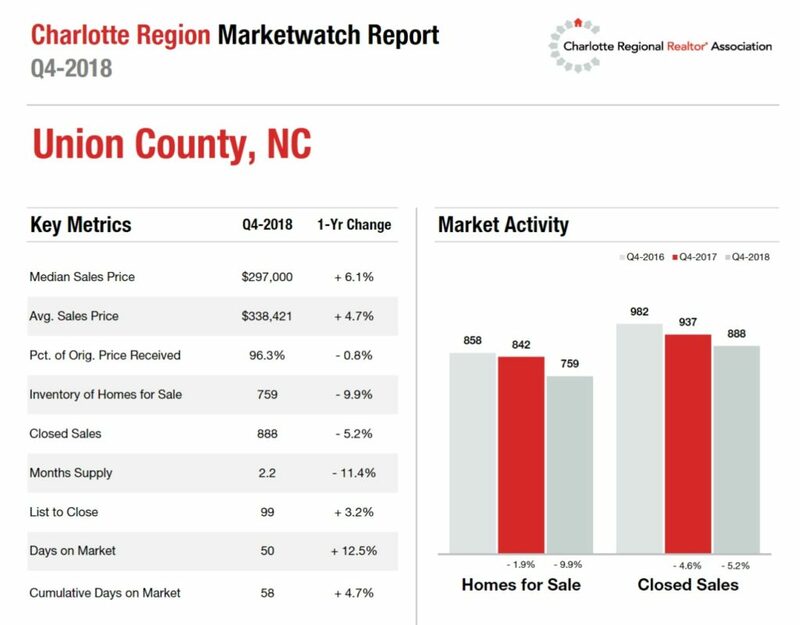 With regional months supply of homes at 2.2 months, the Charlotte region remains very much a seller's market.